Arts, media and culture have diverse facets. Our Intellectual Properties are forays to celebrate and revive the love for the written word, encourage free thinkers and writers, create a platform for the interaction of professionals in the media, technology and communications spheres, foster the creative spirit and reward effective marketing. Making us an extraordinary platform for really extraordinary minds. ZEE Jaipur Literature Festival in India is the world’s largest free literature festival. Hosting some of the best & most-renowned authors, ranging from Noble Laureates & Man Booker Prize Winners to debutants, the festival serves as a beacon of free speech around the world, and has inspired more than 200 other literature festivals, both in India and other countries. ZEE JLF was awarded ‘Best Festival’ at the Outlook Traveller Awards in India. Dubbed "the greatest literary show on Earth," ZEE JLF successfully expanded to London in 2014, and selected Boulder as its only U.S. location in 2015. The year 2017 witnessed the 10th edition of ZEE Jaipur Literature Festival which was focused on the theme of 'Love for the Written Word'. Drawing people from all parts of the globe, the Festival brought together some of the world's greatest minds from all walks of life including authors, humanitarians, historians, politicians, business leaders, sports people and entertainers, to participate in an exchange of thoughts, culture and ideas. With this festival, ZEE aims to revive the love and passion for literature amongst audiences. Held on May 20th & 21st, 2017 at Southbank, the ZEE Jaipur Literature Festival returned to London, presenting a sumptuous showcase of South Asia's literary heritage, oral and performing arts, books and ideas, dialogue and debate in its fourth edition. The British Library spaces were brought to life in a two-day taster of what is sometimes called 'the greatest literary show on Earth', the extraordinary free festival which takes place in the Pink City of Jaipur, India, every January. The third annual ZEE JLF at Boulder which took place from September 15-17, 2017 at the Main Boulder Public Library, featured more than 40 sessions that covered topics ranging from migration and climate change to sexuality, Russia and North Korea. Attendees from throughout the U.S. and across the globe experienced an uplifting celebration of the mind and heart, as nearly 70 authors from across the Americas, Asia, Africa and Europe engaged in provocative conversations and presented new takes on current events. 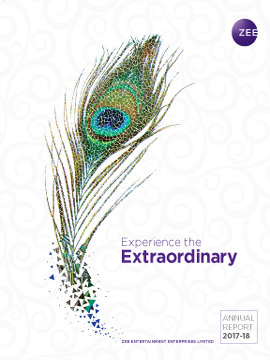 ZEE MELT is India’s biggest festival for disruptive marketing and communications. It caters to audiences in marketing, advertising, media & PR, emerging technology and mobility. The 3rd edition of ZEE MELT was held in Mumbai from May 31 – June 02, 2017 and brought together some of the biggest names in marketing, media, digital innovation and creativity. The festival consisted of a range of conferences, seminars, exhibitions, showcases, workshops and networking sessions for delegates by industry experts, catering to all experience levels. ZEE’s brand intellectual property, ZEE Mindspace Conference aims at bringing the marketing fraternity together to connect, discuss and explore new possibilities. The sessions under ZEE Mindspace Conference 2016 comprised of two main themes – Previewing Tomorrow & Open Possibilities. The renowned speakers at the 4th edition of the conference included: R Ray Wang, Principal Analyst, Founder & Chairman, Constellation Research, Vanessa Clifford, Deputy Chief Executive, News Works, Tom Goodwin, SVP of Strategy & Innovation, Havas Media, Jeff Bullas, Blogger, Strategist and Speaker, Tom Betts, Chief Data Officer, Financial Times, Per Nilsson, Corporate Communication & Marketing Director, Semcon, Brian Gleason, Global CEO, XAxis and Tomi Ahonen, Technology & Media Author + Strategy Consultant. The first edition of ‘ZEE Mindspace Awards’ was launched in 2016. It aims at recognising brands, which have captured maximum ‘MindSpace’. ZEE partnered with renowned market research company, Nielsen, to execute a nationwide research to identify brands which have created maximum impact on the minds of the consumers. While ‘Top of the Mind Recall’ was the primary criteria to arrive at the winning brands, factors like Popularity, Advocacy, Desire and Buzz were also a part of the structured research methodology. Nielsen targeted a sample size of 12000+ audiences, covering key zones across the country. The winning brands were awarded at the ZEE Mindspace Awards 2016 in the presence of 500+ CMOs and stalwarts from the marketing and advertising industry. Designyatra is an annual festival of creativity, hosting some of the most famous creative thinkers of the world and a large population of design professionals and students from India. The festival celebrates all aspects of creative communication and marketing. This year the convergence between digital and physical was explored reinforcing the phenomenon that life today cannot be classiﬁed as analog or digital, because it is virtually impossible to distinguish the two. Individuals experience everything together and therefore, the erstwhile boundaries have disappeared. The three day design festival saw many interesting side tracks, besides celebrating creativity and design. An initiative by ZEEL to recognize and applaud the mothers, wives, daughters and sisters of our brave soldiers whose support, dedication and perseverance gives the brave men, the courage and strength to fight fearlessly for the nation. ZEEL aims to honour this ‘Real Army’ of women behind our soldiers, by garnering respect and recognition for them at a national level.